The Delaware Democrat first faced accusations of domestic abuse back in 1982 during his first run for Congress, but he called the accusation "without basis in fact" and prevailed in the election. In a 1998 interview reported on late last year by the Washington Free Beacon, however, Carper admitted it was true all along. "Did I slap my wife 20 years ago? Yes," Carper told Delaware reporter Celia Cohen. "Do I regret it? Yes. Would I do it again? No." The story Carper initially called "totally false" was based on a 1981 court deposition that included Carper admitting to giving his now-deceased first wife "some discoloration of her left eye and some puffiness." "I slapped Diane one time," Carper said in the deposition. "It was a stupid thing to do and I … regret it now. It caused some discoloration of her left eye and some puffiness." Carper's office responded to a request for comment on the allegations against Porter by sending the statement he gave to the New York Times in December following the Washington Free Beacon‘s initial report on Carper's abuse, but said it would not comment on Porter. In the statement, Carper again admitted he hit his first wife Diane, who he divorced shortly after the 1982 election. "I have made many mistakes in my life and have always been willing to admit them," Carper said in the statement. "One of those mistakes took place 37 years ago when I slapped my then-wife, Diane, during a heated argument. It was wrong. I regretted it then and I still do today." Despite his admission, he maintained that he was truthful when he defended himself in 1982. 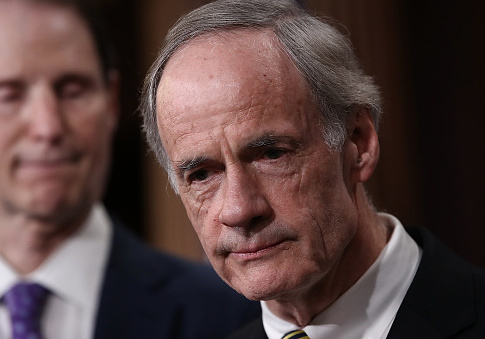 "In 1982, during my first campaign for Congress, I was falsely accused of beating my wife and physically abusing my stepchildren," Carper said. "I defended myself by telling the truth." "Any claim that I lied or attempted to hide my behavior is false. I am a man who has made his share of mistakes, but I am not and never have been one who abuses his wife and children." Carper also admitted to spanking his stepchildren during the deposition. His stepson spoke out in defense of Carper following the resurfaced coverage of his abuse. Carper's office said the Free Beacon should "consider the statement reissued today." "You may consider the statement reissued today," said an office spokesperson. "Since the incident was over 30 years ago, the statement from December is just as relevant today as it was then." Carper's silence in the controversy surrounding Porter comes as other Democratic senators such as Sen. Bob Casey (Pa.) have responded by saying "there must be zero tolerance for domestic violence" and "no one like Porter" should be able to serve in the White House. Sen. Tim Kaine (Va.) said "domestic violence is evil" and "real leaders stand with survivors, not perpetrators." Update 4:43 p.m.: This piece has been updated with comment from Carper's office. This entry was posted in Politics and tagged Tom Carper. Bookmark the permalink.